There you go! My Yoga Studio where they showed us how to "walk" and go on our path on our own. Thank you so much again! 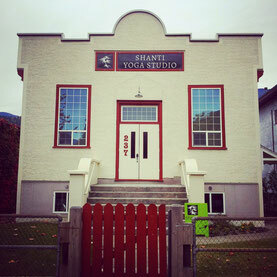 My Yoga Teacher Training was at Shanti Yoga in Nelson BC by lovely Joy and her great team. I learnt a lot during my training. From anatomy and how the muscle partnership work together to how to make Yoga accessible for everyone (beginners, elder people, people with injuries) and also about Thai massage and other things . I was lucky and had very nice and lovely classmates and two lovely roommates as well: beautiful and creative Arlet and sweet and wise Jill with the sexiest hair ever ;-). I learnt a lot about myself and found back to something what I almost forgot about. Something what will be always successful... Just be yourself! Taking the Yoga path came not complete out of the blue. 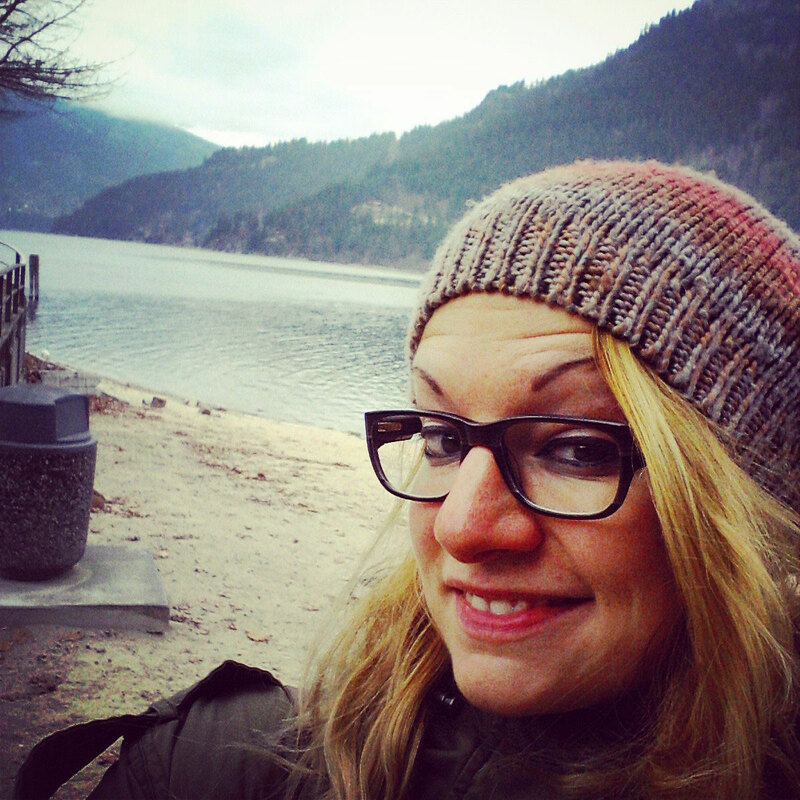 Before I quit my job last December I was thinking about doing a Pilates Teacher Training. I wanted to do something what I love and what helps people as well. 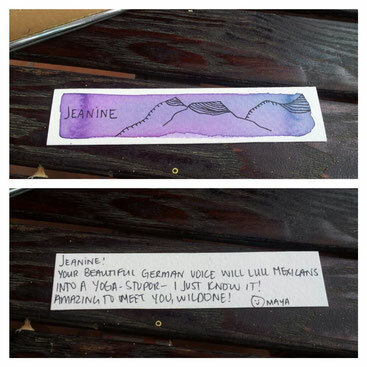 I talked to my Pilates trainer in Germany and got some advice. Well, I saw that it was not exactly what I wanted to do. I found that I needed something as base... So I did my Professional Business Trainer (how to concept and give seminars) in Germany. Just briefly: What is Yoga? Yoga is not just a workout or sport. It is a lifestyle which combines philosophy (for me similar like Buddhism), compassion, self-compassion, mindfulness, nutrition etc. It is a holistic way to bring body and mind in balance and live with more consciousness. For me it is something which focuses on being compassionate to our surroundings and ourselves. How we treat others and ourselves (what do we eat, how we find balance). Well, that is actually true but the way my mentor said that made me feel as if something was not ok with me. I felt actually quite abandoned with this information. Should I change or what should I do with that? So I thought something must be badly wrong with me even if I had no problems before. The opposite was the case that I got things done, meant that what I said and even if I am dominant I still made sure that I was in harmony with others and helped others as well. Anyway, I was very confused and questioned everything what I did and before I did it. I narrowed myself and I didn't listen to my heart. It is our inner voice or our inner-self and I got even more disconnected from it. So step by step I came slowly back to myself. Actually I felt in Spain exactly like I really am. There I felt very natural. Actually I thought I will turn into a better and perfected person when I travel and get to know to different cultures and face my fears. I am becoming for sure more open and experienced but I am still the same person with the same energies. Now I know the real aim is to come home to my inner-self and be in peace with myself. The same energy which let me act without too much thinking is the same energy that get things done, sets and reaches aims, helps people. loves to give experience back and follows my heart... It is that for what my friends and family loves me and I love them for their personalities. It doesn't mean to act like I want without caring about others but to accept it as part of myself. And then it is possible to use it for positive things. I was a bit nervous when I went to the accommodation where I should live the next 5 weeks with two other women. 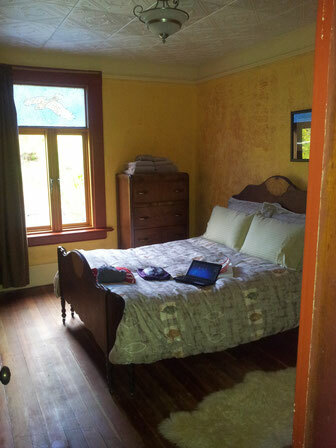 The accommodation named Lotus House and had a deal with Shanti Yoga. lovely and creative Arlet who's daughter lived in Nelson and studied there. Arlet told me that she was thinking about to live in Mexico and just went to Guadalajara lived there for a couple of month and decided than to come back to Canada. Well, very brave :-). She was also an amazing and talented artist. She draw animals and created sculptures of animals who looked like real ones. Her heritage was from Belgium and Holland so was her great humor. I could laugh a lot with her and always cracked up when she imitated something. My room in Lotus House. Actually one of the most beautiful accommodations I had in the last 11 months. 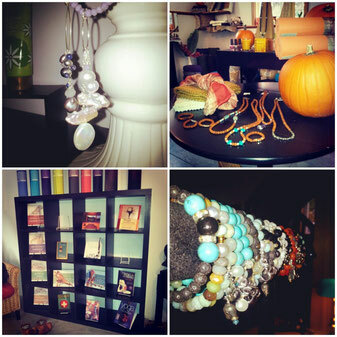 The beautiful shop of Shanti Yoga in Nelson. It contains everything what the Yogi heart needs: from good literature, Yoga equipment to jewelry made by Joy's beautiful daughter Avalon. My Yoga Teacher Training lasted 5 weeks and took 200 hours on the whole. In my class we were around 23 students. Just two very nice men. Sky a young snowboard fan and Brad who traveled with his lovely girlfriend from Ontario to Nelson for the winter season. Our group consisted of people like me who just started the Yoga path and people who were already teaching. It was a great and valuable mix. Joy the owner of Shanti Yoga was very lovely and passionate to share her knowledge with us. She put a lot of emphasis on safe and therapeutic Yoga. A Yoga that is accessible for everyone. So we gained a lot knowledge about anatomy and what kind of Asanas (sanskrit name for Yoga pose) activates which muscle groups, what happens in the body and what to do with people who had injuries. Joy also organized that we got twice a week a meditation session with Phil S., one day we learnt about foot reflexology and gave this to each other. So relaxing! Another day we learnt about Thai massage. Joy invited a local Thai massage therapist who explained to us what it is and how it works. We gave the massage to each other in pairs. It was a beautiful experience. So our whole training was very holistic and we got a lot of space to try ourselves out and teach Yoga. 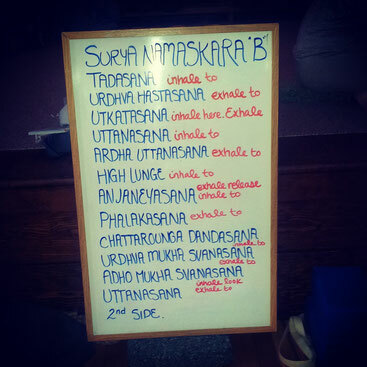 Before my Yoga Teacher Training it would be like Chinese for me... Now it is simple Sun Salutation B ;-). Very great and compassionate teacher: "You get more flies with honey..."
Joy often said the following quote: "You get more flies with honey." and that was like she taught us. She loved to share her knowledge with us and always reminded us to have compassion for ourselves and others and don't judge anyone. I remember when a elder man appeared on the stage of our Yoga room. He looked a bit confused and his clothes like a homeless person. He said that he just wanted to go through the room. Joy went to him gave him a big hug and said that everyone in Nelson would love his art and then she brought him to the entrance. When she came back she said: "Isn't it sad?". I just admired her how she dealt with that man with so much love and compassion. Through Joy I saw how to get the best out of people with love and compassion... Also to let them be themselves instead of trying to make them fit into a special shape. Joy and her team created a safe and compassionate space in which we could develop ourselves. In addition she told us all the time that "Knowledge is Power. Pride is no Power". One day I was very frustrated about myself and pushed myself very hard. I was angry because the vocabulary was difficult and my body couldn't do certain movements. I always thought I have power but my muscles were also thight... I had no compassion at all for myself and cried a bit when we did Yoga. Joy saw it. After the training she came over to me and gave me a big hug and said that she knew how it is to be very ambitious. She said that I would do great and everything was great for me. 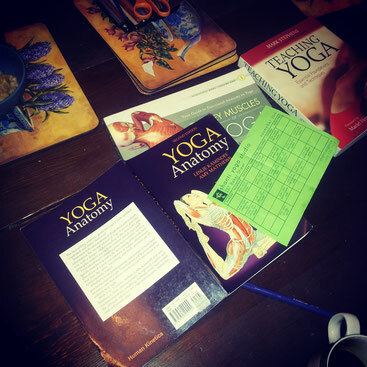 I have to mention that I got in panic during the first days of my Yoga Teacher Training because of the anatomy terms and cues for Yoga teaching. I feared I could fail the exam. At that time my flight was already booked for Mexico... So I asked Joy what about in case I would fail. Joy pleased me that I wouldn't and in case if I could repeat in March for free. Well, that pleased me in a way. But I didn't want to fail... So I needed a good method to learn. How to learn easy and effective? - Learning with a virtual flashcard system! I started to use my Phase 6 program which I already used for learning English. For anatomy it was in the beginning lots of work but in the end I had lots of time to prepare and I was quite relaxed and well prepared for the final writing. It is possible to add images etc. 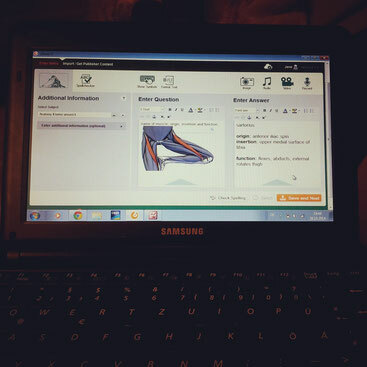 Learning anatomy with my virtual flashcard system. Named Phase 6. It is really a great system for learning and also has an App you can use offline as well. Well, I made it! Actually my practicum was great fun for me. I changed my whole sequence the evening before because I was inspired by another very nice sequence of a friend of mine. After 15 min and a quick check with Jill I was ready. I decided I will just be me without trying to be perfect. So was my practicum. It was very funny with an unplanned slapstick... I explained something to my students - my classmates - when I was walking backwards and forgot about my props laying on the ground. So I fell over them and me and my students started laughing when I just said: Ups salaha! In addition I had no clue that Bird Dog (the name of one pose) stands for a dog which helps hunting. I was always confused what a strange name to combine two very different animals... In my practicum I said:"The next pose has a very cute name: Bird Dog! I don't know what it means but it sounds cute..."
Yep, I had lots of fun and enjoyed it a lot to teach and just being me: not perfect, acting from heart and saying what I think. Really great was that I received a lot of nice feedback for my voice. My classmates and teachers told me that they would love to listen to my voice and that it relaxes them. That is really nice to hear! So I will use this "tool" to help people. All of us in our practicum group got this really lovely and personal bookmark from lovely Maya. I am so happy about it and keep it all the time with me. Me on the next day after I passed everything. 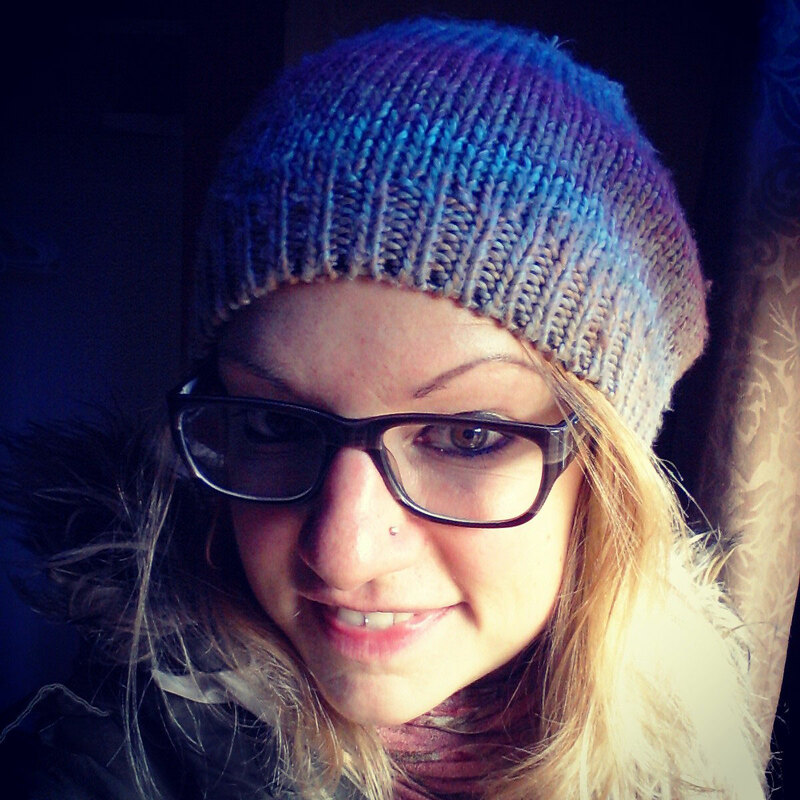 I made myself a gift: a nose piercing! Very Yogi like. I love it :-). After our graduation I spent some more days in Nelson before I finally took the Greyhound bus back to Vancouver to take my flight to San Jóse del Cabo in Mexico. I had finally time to catch up with Jacob. The guy I met at my woofing place in the mountains and went with to save Jumbo Wild. 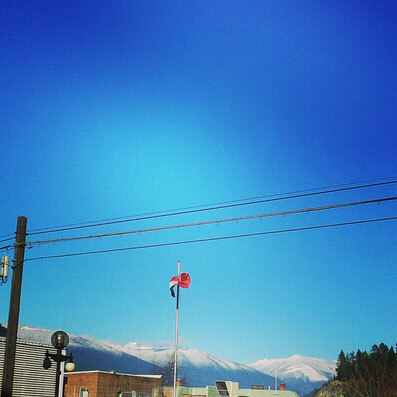 It was already very cold in Nelson and the first snow started to fall down. Very beautiful but also time to head off soon... It was so great to meet Jacob again. He is one of this persons you will meet and feel like you know them for ages even you just talk 5 minutes with them. Every one calls him an ancient soul. It was also great to meet with a guy, have some beer and play dart after 5 weeks almost just women around me :-). We had a very nice evening. When we walked to another bar we met one of Jacob's friends. His friend with his little daughter and invited us to come with him. He had a huge place where also lived another guy: Sean. It turned out Sean grow up in Lemgo that is a city close to my hometown Münster. What a coincidence! Actually Sean's German was better than mine after 5 weeks without talking a single word in German... Very funny. So Jacob and I watched Men in Black I at his friends place and later they walked me to my hostel through the cold but beautiful night. I was very happy to see Jacob again. I got this painting from Jacob. 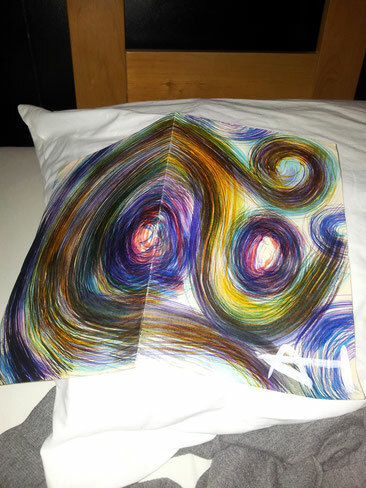 He received it from a friend with depressions. I really like that picture a lot. For me it is very emotional and shows a lot about the painter. On the next day I went early with my luggage to the Greyhound bus station. I walked down Baker Street and passed my favorite cafe John Wards, I looked in and there was he: my mesmerizing Brazilian friend. I saw him and smiled at him. He was writing in a journal, looked up and smiled back. I walked with a big smile to my bus. I was very happy to see him well. Read next time about my arrival in the country of the Frida Kahlo and Tequila: Mexico!